An email has been sent for verification. Avoid Unleashing Malware on the Firm. Quickly access fillable Microsoft Word or PDF forms. Reduce errors by tapping into a centralized database. Largest Forms Database in the Country with more than 80,000 of the most complete federal, state and agency forms. Reduce workload for support staff so they can focus on their billable work. Spend less time locating and updating forms. Copyright – 2016, American LegalNet, Inc. All rights reserved. Reproduction of any portion of this World Wide Web site or FormsWorkFlow.com material is prohibited. Permission to use all documents and related graphics and any other material from this World Wide Web site is subject to these Terms and Conditions. "FormsWorkFlow.com" is a trademark of American LegalNet, Inc. The documents and other materials (the "Materials") published by FormsWorkFlow.com may only be used as permitted by the right-of-use license in these terms and conditions. 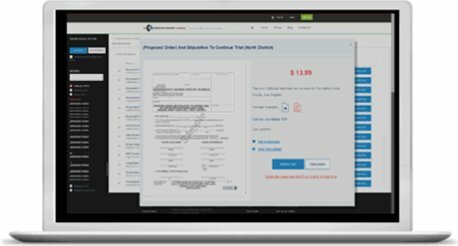 FormsWorkFlow.com provides the Materials under a non-exclusive, non-transferable license for printing and use only by the individual who signed onto this service, and only for that individual's personal use. The user is not permitted to commercially exploit the information or transfer it to any third party. Any reprinting, sublicensing, copying, modifying, publishing, assignment, transfer, sales, or other distribution, text-based, electronic, or other physical or virtual distribution, of the Materials are prohibited without the prior written consent of FormsWorkFlow.com. Copies of the Materials may only be held in local storage systems for personal use only in an archival format. The user may not copy, reverse engineer, translate, port, modify, or make derivative works of the Materials. The user may not rent, disclose, publish, sell, assign, lease, sublicense, market, or transfer the Materials. The user may not derive or attempt to derive the source code or structure of all or any portion of the Materials by reverse engineering, disassembly, decompilation, or any other means. The user may not use the Materials to operate an information bureau. The Materials may not be copied, even if modified or merged with other data or software. The user will not alter or remove any copyright notice or proprietary legend contained in or on the Materials. FormsWorkFlow.com will block access to, or remove, any material on its servers that it believes in good faith to be copyrighted material that has been illegally copied and distributed by any of our customers and will permanently remove and discontinue service to any repeat offender. FormsWorkFlow.com IS NOT LICENSED TO PRACTICE LAW IN ANY JURISDICTION, AND ACCORDINGLY, OUR FORMS ARE ONLY FOR PROFESSIONALS SKILLED IN THE AREAS COVERED THEREBY. FURTHER, WE CANNOT AND DO NOT GUARANTEE THEIR ACCURACY, COMPLETENESS, OR COMPLIANCE WITH THE LAWS OF ANY PARTICULAR STATE. WE DO NOT RECOMMEND USAGE OF FORMS ON THIS SITE BY ANYONE OTHER THAN LICENSED ATTORNEYS. THE USER OF THIS SYSTEM ASSUMES ALL RESPONSIBILITY AND RISK FOR THE USE OF THE MATERIALS AND THE INTERNET GENERALLY. FormsWorkFlow.com AND ITS AFFILIATES DISCLAIM ALL WARRANTIES, REPRESENTATIONS, OR ENDORSEMENTS, EXPRESS OR IMPLIED, WITH REGARD TO THE MATERIALS, INCLUDING, BUT NOT LIMITED TO, ALL IMPLIED WARRANTIES OF MERCHANTABILITY, FITNESS FOR A PARTICULAR PURPOSE, OR NONINFRINGEMENT. FormsWorkFlow.com DOES NOT ASSUME ANY LEGAL LIABILITY OR RESPONSIBILITY FOR THE ACCURACY, COMPLETENESS, OR USEFULNESS OF ANY MATERIAL ON THIS SITE. FormsWorkFlow.com WILL NOT BE LIABLE FOR ANY COMPENSATORY, SPECIAL, DIRECT, INCIDENTAL, INDIRECT, CONSEQUENTIAL DAMAGES, EXEMPLARY DAMAGES OR ANY OTHER DAMAGES RESULTING FROM LOSS OF USE, DATA, OR PROFITS, ARISING OUT OF OR IN CONNECTION WITH THE USE OR PERFORMANCE OF THE MATERIALS. IF THIS LIMITATION OF LIABILITY OR THE EXCLUSION OF WARRANTY IS HELD INAPPLICABLE OR UNENFORCEABLE FOR ANY REASON, THEN FormsWorkFlow.com's MAXIMUM LIABILITY FOR ANY TYPE OF DAMAGES SHALL BE LIMITED TO U.S. $100.00. The Materials may include technical inaccuracies or typographical errors. FormsWorkFlow.com has the right to make changes and updates to any information contained within this server without prior notice. THE MATERIALS ARE PROVIDED ON AN "AS IS" BASIS AND WITHOUT WARRANTIES OF ANY KIND. NO INFORMATION GIVEN BY FormsWorkFlow.com, ITS AFFILIATES, OR THEIR RESPECTIVE EMPLOYEES WILL CREATE ANY WARRANTY. This agreement will be governed by the laws of the state of California without giving effect to its rules of conflict of law. If any provision of this Agreement is declared invalid or unenforceable, the remaining provisions of this Agreement will remain in effect. The user agrees to comply with all applicable laws in using this service or the Materials. This American LegalNet, Inc. ("ALN") End User Agreement ("Agreement") is by and between ALN and you ("You"), and is made effective as of the date of electronic execution by You, or by You otherwise downloading and/or using any ALN websites, the Software, and/or Services. This Agreement sets forth the terms and conditions of Your use of ALN’S software, services, and the ALN website, as applicable ("Materials," Software," and/or "Services"). If You do not agree to the terms of this Agreement, You are not permitted to use the Materials, Software, and the Services. This Agreement covers multiple Services and Software provided by ALN. The actual details of the specific Services and Software are contained on contained on the website describing and/or hosting the applicable Services and Software. This Agreement as well as any additional ALN policies referenced herein constitutes the complete and entire agreement between You and ALN concerning Your use of the Materials, Services, and Software, and supersedes all prior agreements or other communications. By accepting this Agreement, You acknowledge that You have read, understood, and agree to be bound by all terms and conditions of this Agreement. 1. USE, RESTRICTIONS, AND REPRESENTATIONS. ALN provides the Materials, Software, and/or the Services to You under a non-exclusive, non-transferable license for use only by the individual or entity who agreed to the terms of this Agreement, and only for that individual's or entity’s use. You are not permitted to commercially exploit the Materials, Software, and/or the Services or transfer them to any third party. Any reprinting, sublicensing, copying, modifying, publishing, assignment, transfer, sales, or other distribution, text-based, electronic, or other physical or virtual distribution of the Materials, Software, and the Services are prohibited. Copies of the Materials, Software, and the Services may only be held in local storage systems for backup and personal use only in an archival format. You may not copy, reverse engineer, translate, port, modify, or make derivative works of the Materials, Software, and the Services. You may not rent, disclose, publish, sell, assign, lease, sublicense, market, or transfer the Materials, Software, and the Services. You may not derive or attempt to derive the source code or structure of all or any portion of the Materials, Software, and the Services by reverse engineering, disassembly, decompilation, or any other means. You may not use the Materials, Software, and the Services to operate an information bureau. The Materials, Software, and the Services may not be copied, even if modified or merged with other data or software. You will not alter or remove any copyright notice or proprietary legend contained in or on the Materials, Software, and the Services. ALN reserves the right to block access to or remove any material on its servers that it believes in good faith to be copyrighted material that has been illegally copied and distributed by You and permanently terminate Your use of the Materials, Software, and the Services. In the event that you are using any eFiling Services, You authorize ALN to file the applicable filings to any and all courts You have selected to file with. You also represent that You are familiar with and meet the requirements of the applicable courts, including but not limited to any electronic filing training requirements. 2. FEES AND PAYMENT. Depending on the specific Services and Software, there may be an associated fee. Such fees shall be due upon Your enrollment for use of the Services and Software. All fees are exclusive of taxes and You shall be solely responsible for any and all taxes and levies of any kind. Except as otherwise stated in this Agreement, all payments are non-refundable. ALN may modify the fees for any renewal term. 3. INTELLECTUAL PROPERTY. You agree that ALN or its licensors holds all rights, title and interest in the Materials, Services, and Software and all intellectual property, including other rights related to intangible property related thereto, including but not limited to copyrights, patents, Trademarks, and trade secrets ("Intellectual Property"). You acknowledge that no title or interest in such Intellectual Property Rights is being transferred to You. You further understand and agree that You are prohibited from using and reproducing, in any manner whatsoever, any of the content or materials of the ALN website, without the express written permission of ALN. Any permission to use any documents and related graphics and any Materials, Software, the Services, uscourtforms.com, any other ALN website, any other website accessed as part of any Services (including but not limited to, texas.efilingportal.com, broward.efilingportal.com, www.efilingportal.com, www.formsworkflow.com) is subject to this Agreement. American LegalNet, ALN, USCourtForms.com, USCourtForms, ALN, FORMS WORKFLOW, eDockets and AUTODOCKET are trademarks and service marks of ALN. 7. DISCLAIMER OF WARRANTIES AND LIMITATION OF LIABILITY. ALN IS NOT LICENSED TO PRACTICE LAW IN ANY JURISDICTION, AND ACCORDINGLY, ALN’S MATERIALS, SOFTWARE, AND THE SERVICES ARE ONLY FOR PROFESSIONALS SKILLED IN THE AREAS COVERED THEREBY. THEREFORE, ALN DOES NOT RECOMMEND USAGE OF ANY FORMS AND RULES BY ANYONE OTHER THAN LICENSED ATTORNEYS. ALN CANNOT AND DOES NOT GUARANTEE THEIR ACCURACY, COMPLETENESS, CURRENTNESS, OR COMPLIANCE WITH THE LAWS OF ANY PARTICULAR STATE OR OTHERWISE. YOU ASSUME ALL RESPONSIBILITY AND RISK FOR THE USE OF THE MATERIALS, SOFTWARE, AND THE SERVICES. YOU ALSO ASSUME ALL RESPONSIBILITY AND RISK FOR ANY INACCURACIES YOU ENTER INTO ANY FORMS AND INCOMPLETE FORMS YOU SUBMIT USING THE EFILING SERVICES; AND INNACURATE COURT RULES, NEW COURT RULES, AND COURT RULES CALCULATIONS. ALN WEBSITES AND THE SERVICES MAY CONTAIN LINKS OR FORWARD INFORMATION TO OTHER WEBSITES. ALN AND ITS AFFILIATES DISCLAIM ALL WARRANTIES, REPRESENTATIONS, OR ENDORSEMENTS, EXPRESS OR IMPLIED, WITH REGARD TO THE MATERIALS, SOFTWARE, AND THE SERVICES, INCLUDING, BUT NOT LIMITED TO, ALL IMPLIED WARRANTIES OF MERCHANTABILITY, FITNESS FOR A PARTICULAR PURPOSE, OR NON-INFRINGEMENT. THE MATERIALS, SOFTWARE, AND THE SERVICES ARE PROVIDED ON AN "AS-IS" AND "AS-AVAILABLE" BASIS. ALN WILL NOT BE LIABLE FOR ANY COMPENSATORY, SPECIAL, INCIDENTAL, INDIRECT, CONSEQUENTIAL DAMAGES, EXEMPLARY DAMAGES OR ANY OTHER DAMAGES RESULTING FROM LOSS OF USE, DATA, OR PROFITS, ARISING OUT OF OR IN CONNECTION WITH THE USE OR PERFORMANCE OF THE MATERIALS, SOFTWARE, AND THE SERVICES. ALN 'S MAXIMUM LIABILITY FOR DIRECT DAMAGES IS LIMITED TO U.S. $100.00. 8. INDEMNIFICATION. You agree to defend, indemnify and hold harmless ALN and its contractors, agents, employees, officers, directors, shareholders, and affiliates from any loss, liability, damages or expense, including reasonable attorneys' fees, resulting from any third party claim, action, proceeding or demand related to Your use of the Materials, Services, the Software, or Your breach of this Agreement or incorporated agreements and policies. In addition, You agree to indemnify and hold ALN harmless from any loss, liability, damages or expense, including reasonable attorneys' fees, arising out of any breach of any representation or warranty provided herein or any negligence or willful misrepresentation or misconduct by You. You agree that ALN shall have the right to participate in the defense of any such claim through counsel of its own choosing. You agree to notify ALN of any such claim promptly in writing and to allow ALN to control the proceedings. You agree to cooperate fully with ALN during such proceedings. Your subscription to American LegalNet Services will continue until: (1) Terminated by ALN and/or American LegalNet for (i) non-payment or for other material breach of this Agreement for which You shall have no right to any refund or (ii) any other reason (You will then receive a pro-rated refund); or (2) Terminated by You for any reason, in which case You shall notify American LegalNet in accordance with Section 10.2. Your subscription to USCourtForms Premium Services is for a term of one (1) year. If You terminate the subscription prior to the annual anniversary date of the subscription, You shall have no right to any refund. ALN may terminate this Agreement for (i) non-payment or for other material breach of this Agreement for which You shall have no right to any refund or (ii) any other reason (You will then receive a pro-rated refund). Your subscription to eDockets and use of the eDockets software is for a term of one (1) year. If You terminate the subscription prior to the annual anniversary date of the subscription, You shall have no right to any refund. ALN may terminate this Agreement for (i) non-payment or for other material breach of this Agreement for which You shall have no right to any refund or (ii) any other reason (You will then receive a pro-rated refund). Your subscription to ALN’s eFiling Services will be based on which option you select. It will either be a one-time use or a one year term. Each will terminate thereafter (as applicable). The one year term option will have a seven day right of cancellation if you are dissatisfied with the one year eFiling Service. You must notify American LegalNet within the seven day period or the right will expire. ALN provides free services through USCourtForms.com and Formsworkflow.com. If You are not charged a fee at any point, You are subject to these terms. In addition, use of blogs and RSS feeds are also free. Free Services are provided as a courtesy and may be terminated by ALN at any time. Your use of the Software is for a term equal to the term of the Service for which it is being used for, or as otherwise stated in the applicable description of the Software. The termination rights and privileges similarly follow the termination rights and privileges of the Services for which it is used for, or as otherwise stated in the applicable description of the Software. For items b-d and f above that are for a one (1) year term, the Services and Software (where applicable) will automatically renewal for additional one (1) year terms at ALN’s then-current fees, unless either party gives notice to the other party at least thirty (30) days prior to the applicable term, of its desire to not renew. 9.2 EFFECT OF TERMINATION. Upon termination of this Agreement, You shall stop using the Materials, Software, and the Services. All outstanding fees owed by You shall be due immediately. 10.1 GOVERNING LAW, VENUE; WAIVER OF TRIAL BY JURY. This Agreement shall be deemed to be entered into in and governed by the laws of the State of California. You agree that any action relating to or arising out of this Agreement shall be brought in the courts of Los Angeles County, California. You agree to waive the right to trial by jury in any proceeding that takes place relating to or arising out of this Agreement. 10.6 ENTIRE AGREEMENT. You agree that this Agreement including the policies and agreements it refers to constitute the complete and only Agreement between You and ALN regarding the Services and Software contemplated herein. Notwithstanding the foregoing, ALN reserves the right to modify this Agreement at any time by posting an updated version of it on its website. In the event You do not agree to the changes, you may terminate this Agreement in accordance with Section 9. 10.9 FORCE MAJEURE. ALN will make reasonable efforts to keep its Website and the Services operational. However, certain technical difficulties and other factors outside of its control may, from time to time, result in temporary service interruptions. You agree not to hold ALN liable for any of the consequences of such interruptions. Privacy is very important to us here at American LegalNet. We want to make your experience with us as easy and valuable as possible. We want you to use the Internet¹s vast array of information, tools, and opportunities with complete confidence. American LegalNet, Inc. collects information in different ways from visitors and users who access the various parts of our services and products. We use this information primarily to provide you a customized experience as you use our services and products. However, we may disclose personal information collected if we have received your permission beforehand or in very special circumstances, such as when we believe that such disclosure is required by law or other special cases described below. Users are asked to provide certain personal information when they sign-up for our services including but not limited to, name, address, telephone number, and the type of personal computer being used to access the services. The personal information collected from users during the registration process is used to manage each user¹s account (such as for billing purposes) and contact the user if there are any questions with the registration and/or order. We may also contact you by phone or e-mail with sales inquiries for additional products and services offered by American LegalNet. This information is not shared with third parties, unless specifically stated otherwise or in special circumstances. However, in instances where American LegalNet, Inc. and a partner jointly promote the services, American LegalNet, Inc. may provide the partner certain personal information for the purpose of allowing us and the partner to fulfill and assess the results of the promotion. In this instance, personal information may not be used by the partner for any other purpose. American LegalNet, Inc. may also generate non-identifying and aggregate profiles from the personal information users provide during registration (such as the total number, but not the names, of users). As explained in more detail below, we may use this aggregated and non-identifying information to sell advertisements that appear on the services. American LegalNet, Inc. may store information that it collects through cookies, log files and third parties to create a profile of American LegalNet, Inc. users and visitors. A profile is stored information that American LegalNet, Inc. keeps on individual users that details their viewing preferences. Consequently, collected information may be tied to the user's personally identifiable information to provide offers and improve the content of the site for the user or visitor. This profile may be used to tailor a user's visit to our Web sites, and to direct pertinent marketing promotions to them. American LegalNet, Inc. does not share personally identifiable elements of your profile with other third parties. Your profile is shared in aggregate form only. Some American LegalNet, Inc. products and services are offered to visitors and users in conjunction with a nonaffiliated partner. For example, we may form working relationships with electronic filing companies to allow their customers access to our forms. To provide visitors and users some of these products and services, the partner may need to collect and maintain personal information. In these instances, you will be notified before any such data is collected or transferred and may decide not to use that particular service or feature. If you order products directly from American LegalNet, Inc., we will use the personal information you provide only to process that order. We do not share this information with outside parties except to the extent necessary to complete that order. American LegalNet, Inc. displays online advertisements. We share aggregated and non-identifying information about our visitors and users collected through the registration process as well as through online surveys and promotions with these advertisers. Additionally, in some instances, we use this aggregated and non-identifying information to deliver tailored advertisements. American LegalNet, Inc. does not share non-aggregated and identifying information about its visitors or users with these advertisers. When visitors or users send email inquiries to American LegalNet, Inc., the return email address is used to answer the email inquiry we receive. American LegalNet, Inc. does not use the return email address for any other purpose and does not share the return email address with any third party. We may periodically conduct visitor and/or user surveys. We encourage our visitors and users to participate in these surveys because they provide us with important information that helps us to improve the types of services we offer and how we provide them to you. Your personal information and responses will remain strictly confidential, even if the survey is conducted by a third party. Participation in our surveys is voluntary. We take the information we receive from individuals responding to our surveys and combine (or aggregate) it with the responses of others to create broader, generic responses to the survey questions (such as specialty, types of litigation, city, forms most commonly used, types of clients, or other demographic information). We then use the aggregated information to improve the quality of our services to you, and to develop new services and products. This aggregated, non-personally identifying information may be shared with third parties. Like most Web sites, American LegalNet, Inc. servers use log files to analyze trends, administer the site, track user's movement in the aggregate, and gather broad demographic information for aggregate use. IP addresses, etc. are not linked to personally identifiable information. The Smart Dockets mobile application and website collect and report back to American LegalNet the following data based on usage: Court Rule Set, Trigger, Trigger Date, Service Type, Client Number, Matter Number, Case Title, and Events generated. This information is never shared and will be used solely to improve the Services provided by American LegalNet. Clear gifs are tiny graphics with a unique identifier, similar in function to cookies, and American LegalNet, Inc. may use them to track the online movements of users and visitors. Clear gifs are invisible on the page and are much smaller than cookies, about the size of the period at the end of this sentence. Clear gifs are not tied to users' personally identifiable information. American LegalNet, Inc. may also use clear gifs in HTML-based emails to let American LegalNet, Inc. know which emails have been opened by the recipients. This allows American LegalNet, Inc. to gauge the effectiveness of certain communications and the effectiveness of our marketing campaigns. If users and visitors would like to opt-out of these emails, please see the Opt-out section. American LegalNet, Inc. may provide Users, Visitors, and any other parties that communicate with American LegalNet, Inc. with offers for American LegalNet, Inc. products and services, unless they opt-out of such notifications. It is American LegalNet, Inc. policy not to use or share the personal information about visitors of users in ways unrelated to the ones described above without also providing you an opportunity to opt out. However, American LegalNet, Inc. may disclose personal information about visitors, users, or information regarding your use of the services or web sites accessible through our services, for any reason if, in our sole discretion, we believe that it is reasonable to do so, including: to satisfy laws, rules, and regulations, such as the Electronic Communications Privacy Act and CAN-SPAM Act, and/or governmental or legal requests for such information; to disclose information that is necessary to identify, contact or bring legal action against someone who may be violating our Acceptable Use Policy or other user policies; to operate the services properly; and/or to protect American LegalNet, Inc. and our users and visitors. Services and websites we sponsor have security measures in place to protect the loss, misuse, and alteration of the information under our control. American LegalNet, Inc. works with VeriSign/PayPal Secure Site Programs to encrypt your personal and credit card information through Secure Socket Layers (SSL), the industry standard used on the internet. We encourage users and visitors and users to protect themselves too. If you are using a shared computer, be sure to sign off completely when you have finished ordering. While we make reasonable efforts to ensure the integrity and security of our network and systems, we cannot guarantee that our security measures will prevent third-party "hackers" from illegally obtaining this information. American LegalNet, Inc. offers Users the opportunity to access or modify information provided during registration and to opt-out of future communications from American LegalNet, Inc. To do the foregoing, click here or contact our Customer Service Department at (800) 293-2771. In the event American LegalNet, Inc. goes through a business transition, such as a merger or acquisition by another company, or sale of all or a portion of its assets, your personally identifiable information will likely be among the assets transferred. You will be notified of any change in ownership or control of your personal information via a prominent notice on our Web site for thirty (30) days after the business transition has occurred. American LegalNet, Inc. reserves the right to revise, amend, or modify this policy at any time and in any manner. Any revision, amendment, or modification will be effective thirty (30) days after American LegalNet, Inc. posts notice on its website or otherwise informs its users.